Wind is a fun preschool theme to explore. There is a certain mystery to wind, even for adults. We can't see it, but we can see the results of the wind. 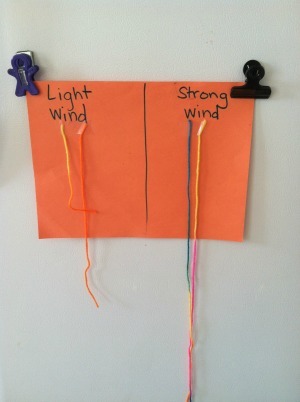 Wind can be fun for science time, but wind can also be extended into a preschool theme. There are great books about wind, fun ways to write about wind, and wind can even provide imaginative play. 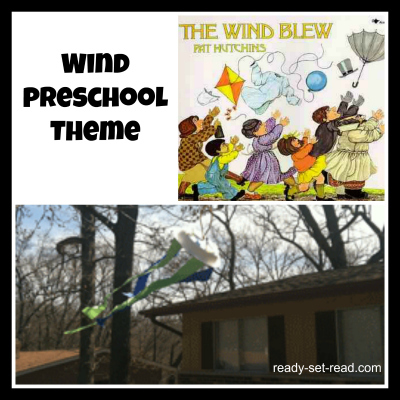 One book that demonstrates wind well to preschoolers is "The Wind Blew" by Pat Hutchins. In this story, the wind whisks up hats, balloons, kites, wigs, newspapers, scarves and more. As each item flies into the air, the owner of the item joins in chasing the objects. Finally the wind mixes up the items, and deposits them back. The final picture shows all of the items with the wrong owner. My boys thought little girls wearing top hats or wigs made for a hilarious ending. "The Wind Blew" can be used for children to predict or retell. Before reading the story, we talked about some of the things that could be picked up by the wind. We talked about experiences of having our things blown away by the wind. We predicted which things the wind might blow. After reading the story, we retold some of the items that the wind moved. 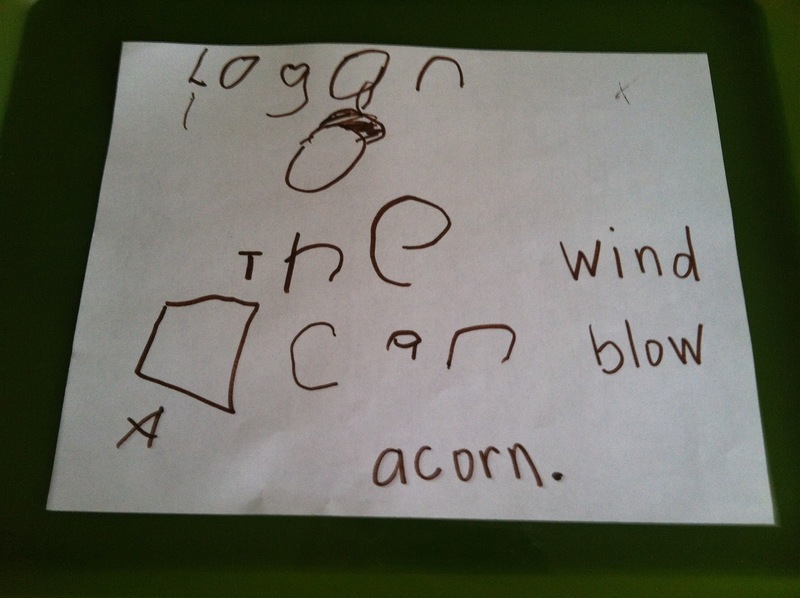 Logan made this windsock at preschool. 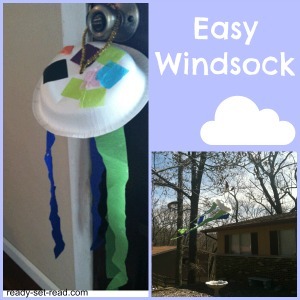 Windsocks provide great conversation starters like, "Is it windy today? Which direction is the wind blowing?" To make a windsock, decorate the top of a paper bowl. Logan's class used small squares of tissue paper which make for a pretty spring look! Then tape streamers around the bowl. Poke a hole through the top, and insert a pipe cleaner loop. Secure the loop under the bowl. The pipe cleaner will provide a hanger for the wind streamer. Hang outdoors and watch the wind blow. Science observation in early childhood often provides a wonderful opportunity for preschool early writing. After reading the story, we experimented with objects our light wind (our breath) could blow and things our wind could not blow. First, we made predictions as to which objects the wind could blow or could not blow. Then we tested our predictions. We placed the objects on the correct place on the chart and then picked one to write about. (I got this idea from a Science Kit I purchased from Time for Tots on Etsy a couple years ago0> In preschool, writing may be drawing a picture. In drawing a picture, the child is building an understanding that writing is a message sending activity. I helped the boys write a simple sentence. The wind can blow __________. This could make a wonderful class book as well. Note: Logan and I did a writing activity called, "Share the Pen". He wrote the part that he could write and I wrote the rest. We used an Elkonin box to figure out the word "can" on our practice page. As you can see, he thought he was supposed to draw the sound box into the writing! We had so much fun pretending to be the wind, the boys wanted to continue playing. I gave the boys straws and cotton balls. We practiced blowing with strong "wind" (blowing hard through the straw) and light "wind" (blowing lightly through the straw). After we blew the cotton ball from a starting line, we measured the distance with string. The hard wind always blew the cotton ball the farthest. 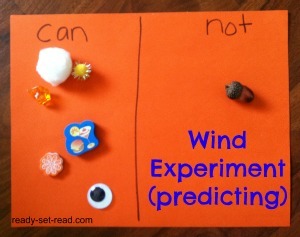 This was a good way to involve gross motor, pretend play, and math into our preschool theme on wind. Would you like more preschool themes? I'm currently working on compiling all of my preschool themes onto one page. It's still under construction, but check out my newly added back to school, shapes, and colors themes! What great learning fun! I'm returning your visit to www.magicalmouseschoolhouse.com, and am so happy I stopped by! This is great! Thanks for putting it all together! Thanks! I hope you can use the wind theme! I love Pat Hutchins, but I have never read that book! Flora's Windy Day is another good one. 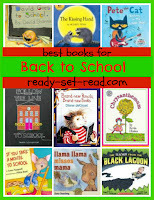 Thanks for sharing at The Children's Bookshelf! We haven't read this book and so need to the experiments looks like a lot of fun. I will be sharing this post on Pinterest and Facebook. Thanks for sharing the post. I think you'll love doing the experiments with your son. My boys are still talking about if the wind can/can't blow an object away! This is a fun idea! I love all that you did! I hope you can enjoy the wind unit as much as we did! Thanks for your encouraging words.